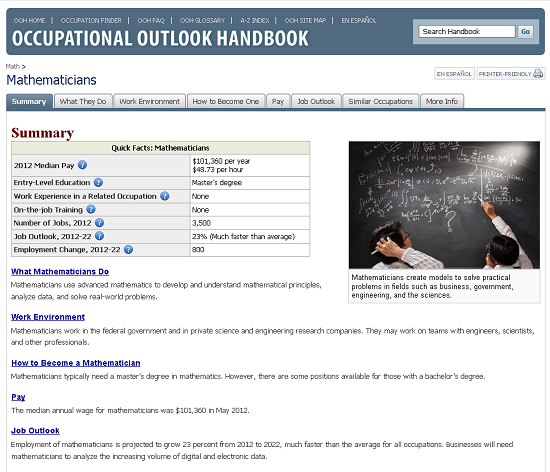 The Occupational Outlook Handbook, from the U.S. Department of Labor's Bureau of Labor Statistics, is an excellent source for information about many different occupations. O*NET OnLine, sponsored by the U.S. Department of Labor's Employment & Training Administration, offers a variety of options for your career search. One highlight of O*NET is the detailed breakdowns for each career field. Within the Hospitality and Tourism cluster, for example, you'll find over 100 distinct occupations listed, from lodging managers to baristas to recreation workers. Each occupation will provide a detailed analysis of tasks, skills, abilities, work styles and values, and much more. My Next Move is an interactive tool for job seekers and students to learn more about their career options. The site has tasks, skills, salary information, and more for over 900 different careers. Find careers through keyword search; by browsing industries that employ different types of workers; or through the O*NET Interest Profiler, a tool that offers personalized career suggestions based on a person's interests and level of work experience. Illinois Career Information System (CIS) is part of the intoCareers consortium and offers local, state and national labor market information for businesses, educators, government agencies, researchers, and students, including the Illinois Career Resource Network which provides career development tools for everyone from elementary school students to adult job seekers and second career seniors. Their goal is to produce the most up-to-date, reliable information to help make important life decisions. Illinois residents : login by entering your city or town and zip code. Browse the Reference stacks (3rd floor, near the reference lab) around HF 5380 to find more career guides. In addition, you can find the 15th edition (2011) of Encyclopedia of Careers and Vocational Guidance online via EBSCOhost. This will search a collection of useful article databases, including Academic Search Complete, Business Source Elite, Health Source Nursing/Academic, and more. Some articles will be fairly generally focused, while others will be quite specialized and will be based on research studies conducted with people working in a particular field. These can provide you with in-depth insight into career satisfaction, working conditions, and so forth. EIU's Career Services provides a resource called Vault Campus Edition that provides company profiles, career guidebooks, an internship database and job board, sample resumes, and more. See the link above for directions on how to log in to Vault.